Two weeks ago, traders were puzzled by the ECB's especially dovish stance (just days before the Fed followed suit). 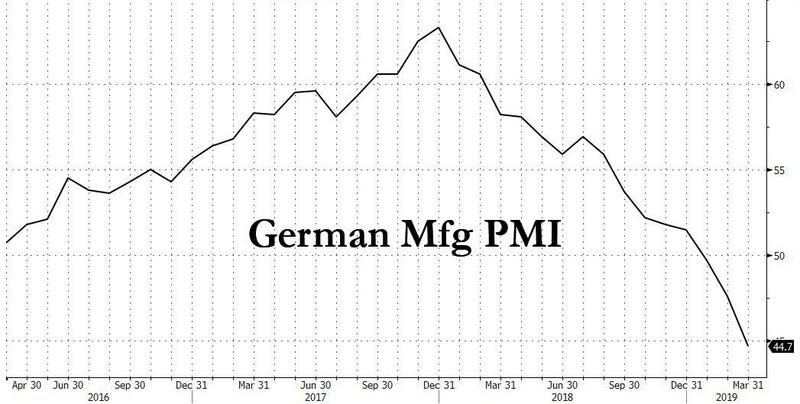 They got their answer today with the release of the latest German and French manufacturing PMIs, both of which cratered deeper into contraction territory. Confirming that Germany - and Europe - is currently in a deep manufacturing recession, Markit’s Manufacturing PMI crashed to 44.7 from 47.6, the lowest since 2012 and far below economists’ expectation of a modest rebound to 48. That’s the third consecutive reading below 50, which indicates contraction (and recession). The new orders and employment components also declined. "The downturn in Germany’s manufacturing sector has become more entrenched," said Phil Smith, Principal Economist at IHS Markit. "Uncertainty towards Brexit and US-China trade relations, a slowdown in the car industry and generally softer global demand all continue to weigh heavily on the performance of the manufacturing sector, which is now registering the steepest rate of contraction since 2012." “The domestic market remains strong, which continues to be reflected in wage pressures and robust growth across the services sector of the economy, but the question is whether it can withstand a protracted downturn in manufacturing. The first decrease in factory employment for three years is perhaps a warning sign for the health of domestic demand, with overall job creation now running at its lowest since May 2016." Markit said if the weakness persists into the next quarter, it may leave the euro-zone economy struggling to grow by much more than 1 percent this year. The ECB currently sees growth averaging 1.1 percent in 2019. Commenting on the striking decline, Bloomberg economist Maeva Cousin said that "This disappointing reading raises the risk that euro-area growth failed to recover decisively in the first quarter, after last month’s rebound had provided a glimmer of hope that 2019 was starting on a stronger footing." As Bloomberg further notes, much of the source of the economic weakness appears to be external, with export orders - particularly in manufacturing - under pressure. Trade tensions, tariffs and weaker global growth are all taking a toll, with Germany feeling much of the pain. Japan, another export heavy economy, also reported a contraction in activity in its manufacturing sector on Friday. 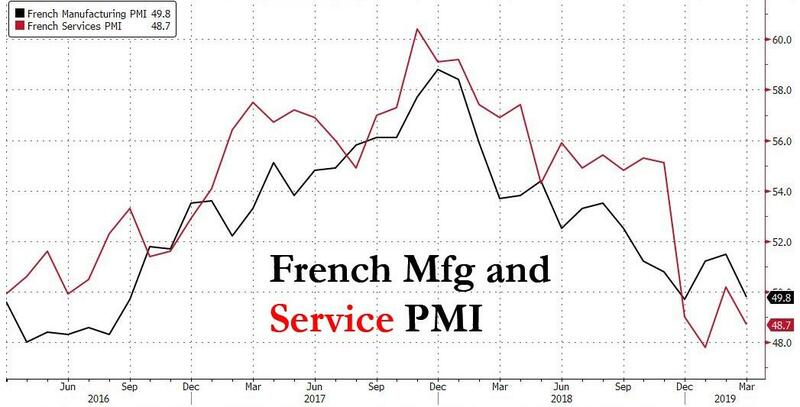 Elsewhere, France - where the ongoing Yellow vest protests have continued to sap the economy - was also hit with the Manufacturing PMI also sliding into contraction, from 51.5 to 49.8, while the Service index tumbled 50.2 to 48.7. 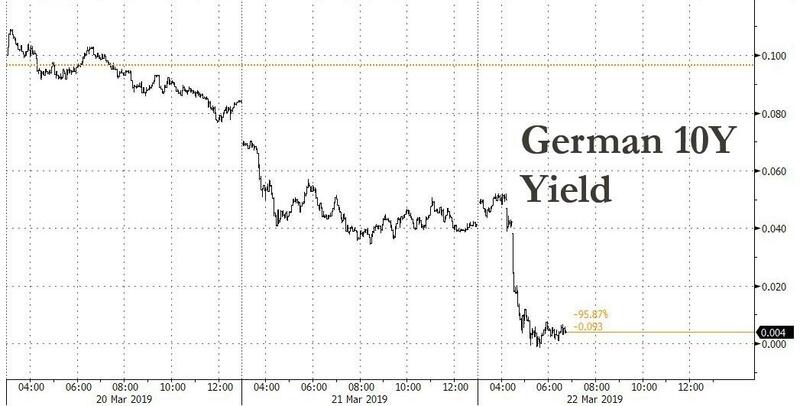 While jolting markets, the latest recessionary data confirms that the ECB was badly behind the curve entering 2019, as it ended its QE program (alternatively one can say that Europe's QE has led to the current recession) and explains Draghi's panic to launch the TLTRO as soon as possible. 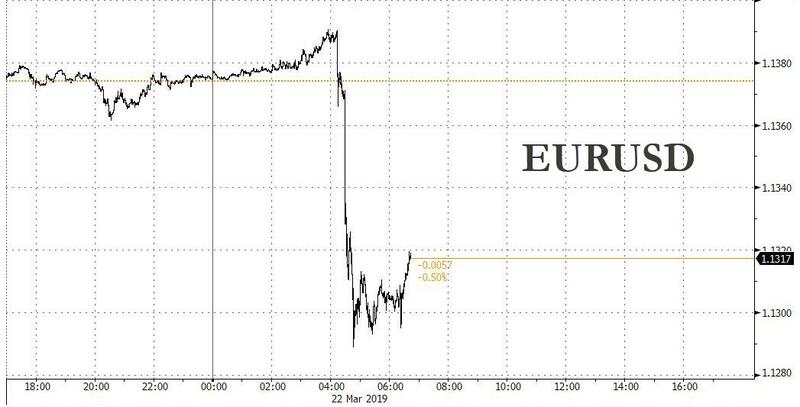 Following the latest dismal data out of the Eurozone, the euro tumbled nearly 100 pips, briefly sliding 1.13 before staging a modest rebound. ... as traders anticipate that just months after the ECB halted its sovereign debt QE program it will have no choice but to restart it.